The phonebook displays a list of names and pictures only. There is a search field at the top and a hidden alphabetical scrubber on the right. A swipe up from the bottom of the list gets you the Advanced menu and an Add new contact shortcut. The actual contact details are displayed on a completely redesigned screen. You get the contact's picture on the left and the contact's name right next to it. There is also a small star on the right which will promote the contact to your Favorites list. You can add various details to your contacts, like numbers, mail address, ringtone or a URL. You can also choose where to save your contacts - the SIM or the phone memory. Only two sorting options are available - by first or last name. Contacts can be copied, moved, linked to another contact or deleted either individually or in bulk. The Phone app of the Asha 503 is pretty straightforward and works well. The app integrates with the Call log and the Dialer and that's more than welcome. The dialer itself is pretty standard, but sadly it doesn't offer smart dialing. In case you've entered VoIP settings, you can initiate a VoIP call from here by holding the # key. The in-call screen shows options for the keypad, muting a call, putting it on speaker, holding it and entering contacts. If you leave the in-call screen the status bar will notify you of an ongoing call and within a tap on it you'll be back to the Dialer. Reception with the Asha 503 was consistently good and in-call sound was loud and surprisingly clear. We've put the Asha 503 loudspeaker through our traditional test and we found it loud enough not to miss calls or notifications. The messaging department has everything covered - text messages are organized in threads, there's a chat client with support for multiple services and of course, a feature rich email client with quick setup. A tap and hold on a Conversation in lets you delete the conversation. Creating a message is pretty straightforward. You can add multiple contacts from your phonebook or simply punch in numbers. For text entry, you can choose between a multitap keypad and a QWERTY keyboard (the default option). You get a character and message counter either way. Unfortunately, there's no text selection or copying. If you choose to attach an image, video or audio file, your message will be automatically converted to an MMS. If you opt for an email instead a phone number, you'll be also sending a multimedia message instead of a regular one. The QWERTY keyboard is completely redesigned and we found texting on the Asha 503 extremely easy despite the small screen and keyboard keys. The accuracy of the keyboard is really impressive. Both portrait and landscape modes of the keyboards are available as well as text prediction. The email client supports various services such as Google, Yahoo, Hotmail, etc. with easy email setup, but you can always manually configure an account too. It works with POP3, SMTP, and IMAP4 protocols and supports SSL. The default email view mode is Inbox but Folder view is supported too. Multiple emails can be deleted using the advanced menu at the bottom of the screen. You can switch between accounts from the Mail client's homepage. A tap and hold on an email will allow you to reply, delete, star, forward or mark it as read/unread. Emails are received in the background and a small asterisk appears over the Mail icon in the app drawer when a new email has arrived. The chat client supports multiple services - Facebook, MSN Messenger, Google Talk, Yahoo and Nokia Chat. The tabbed UI of the OS is pleasantly thumb-friendly. WhatsApp is also onboard. 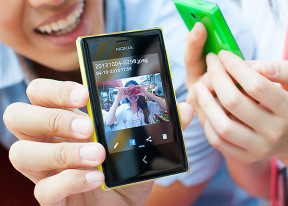 Nokia has a long tradition of supplying file managers on S40 handsets and the Asha 503 makes no exception. The nicely functional app has a clean interface that first lets you select between phone memory and the SD card. You can mass copy, delete and move items and folders, create new folders and sort by name, size, newest and oldest.